Robert I of France (c. 866 – June 15, 923) was the elected King of West Francia from 922 to 923. Before his election to the throne he was Count of Poitiers, Count of Paris and Marquis of Neustria and Orléans. He succeeded the overthrown Carolingian king Charles the Simple, who in 898 had succeeded Robert's brother, king Odo. Robert was born in 866 as the posthumous son of Robert the Strong, count of Anjou, and the brother of Odo, who was elected king of West Francia in 888. In time West Francia evolved into the Kingdom of France; and under Odo, the royal capital was fixed in Paris. Robert and Odo came from the Robertian dynasty out of which the Capetian dynasty grew. In 885 Robert participated in the defence of Paris during the Viking siege of Paris. He was appointed by Odo as the ruler of several counties, including the county of Paris, and abbot in commendam of many abbeys. Robert also secured the office of Dux Francorum, a military dignity of high importance. 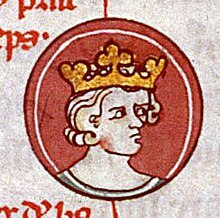 He did not claim the crown of West Francia when his brother died in 898; instead recognizing the supremacy of the Carolingian king, Charles the Simple. Charles then confirmed Robert in his offices and possessions, after which he continued to defend northern Francia from the attacks of Vikings. Robert defeated a large band of Vikings in the Loire Valley in 921, after which the defeated invaders converted to Christianity and settled near Nantes. The peace between King Charles the Simple and his powerful vassal was not seriously disturbed until about 921 when Charles' favoritism towards Hagano aroused rebellion. Supported by many of the clergy and by some of the most powerful of the Frankish nobles, Robert took up arms, drove Charles into Lorraine, and was himself crowned king of the Franks (rex Francorum) at Rheims on 29 June 922. Robert's rule was contested by the Viking leader Rollo, who had settled in the Duchy of Normandy in 911 with the permission of Charles the Simple. During Robert's reign, Rollo remained loyal to Charles, who continued to contest his deposition. Gathering an army, Charles marched against Robert, and on 15 June 923 at the Battle of Soissons Robert was killed. However, his army won the battle and Charles was captured. Charles remained a captive until his death in 929. Robert was succeeded as king by his son-in-law Rudolph, Count of Burgundy, also known as Raoul. Hugh the Great, (898–956) who was later dux Francorum. Hugh was the father of the future Hugh Capet, King of the Franks. 16. Robert I of Hesbaye ? 8. Thuringbert of Hesbaye ? This article incorporates text from a publication now in the public domain: Chisholm, Hugh, ed. (1911). "Robert I., king of France" . Encyclopædia Britannica. 23 (11th ed.). Cambridge University Press. p. 399. Richard I, also known as Richard the Fearless, was the Count of Rouen or Jarl of Rouen from 942 to 996. Dudo of Saint-Quentin, whom Richard commissioned to write the "De moribus et actis primorum Normanniae ducum", called him a Dux. However, this use of the word may have been in the context of Richard's renowned leadership in war, and not as a reference to a title of nobility. Richard either introduced feudalism into Normandy or he greatly expanded it. By the end of his reign, the most important Norman landholders held their lands in feudal tenure. Baldwin III The Young of Flanders was Count of Flanders, who briefly ruled the County of Flanders, together with his father Arnulf I.
Odo II was the Count of Blois, Chartres, Châteaudun, Beauvais and Tours from 1004 and Count of Troyes and Meaux from 1022. He twice tried to make himself a king: first in Italy after 1024 and then in Burgundy after 1032. Adelaide-Blanche of Anjou was the countess consort by marriage of Gévaudan and Forez, of Toulouse, of Provence, and of Burgundy; and queen consort of Aquitaine. She was the regent of Gevaudan during the minority of her sons in the 960s, and the regent of Provence during the minority of her stepson from 994 until 999. Rozala of Italy was a Countess of Flanders and Queen consort of the Franks. She was regent of Flanders in 987-988 during the minority of her son.